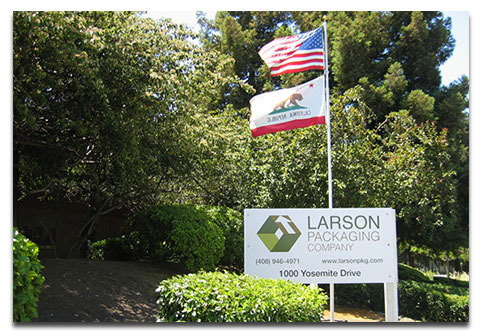 Larson Packaging Company (LPC) has been a recognized leader in custom industrial packaging solutions in the Bay Area for decades. LPC has earned a reputation for quality design and manufacturing of custom crates, ATA cases, foam fabrication, and pallets built to ensure that your products always arrive in perfect, working condition. LPC maintains our valuable relationships through a commitment to understanding the unique needs of your business and a dedication to customer service. We take great pride in our ability to provide custom packaging solutions using the highest-grade materials possible. LPC’s quality workmanship carries through our entire manufacturing process, from our design and engineering expertise to our application of precision, production standards. At Larson Packaging Company we believe professionalism is the cornerstone of customer service. We define professionalism as the courage to care about your people and your customer, and we view it as an attitude, not just a set of competencies. It is a core value of the company that we strive to see reflected in everything we say and do. To better serve your needs, we’ve invested in the best computer technology available, including ERP, CRM and cloud. A locally owned and operated business, Larson Packaging Company has been providing packaging solutions in the Bay Area for many decades. Centrally located in Milpitas, California, our 4.5 acre site is home to our 30,000 square foot manufacturing facility. The outside appearance of our operation appears as professional as the work areas inside; both are neat, clean and well organized. In short, we are a high-volume, built-to-scale, flexible, world-class manufacturing plant. Our computerized systems allow us to offer lean manufacturing and tight scheduling. We can promise and deliver quick turns on prototypes and rush orders. Finally, all this is done without compromising the quality of raw materials drawn from our extensive inventories. Our team members are experienced, capable and the beneficiaries of packaging knowledge accumulated over decades of company history. We are especially proud of our in-depth, design and engineering capabilities as well as our experience in manufacturing, customer service and general business operations. Our entire team is highly skilled but our organization is flat. Integration is made possible through CRM and our effective use of technology. We thrive in a non-bureaucratic environment where each professional is empowered to make decisions and effectively serve our customers.